Mike Newton, the founder and chief innovator at successful CCTV surveillance company NetVu, is supporting the development of the next generation of technology innovators by providing funding for PhD research within the Faculty of Science and Engineering at his alma mater The University of Manchester. Mike, who graduated from the University of Manchester in 1981 with a BSc (Hons) in Computer Science, has been at the forefront of technological innovation within the CCTV sector for more than 30 years, ever since launching the first commercially available CCTV video multiplexer. Mike was one of the earliest undergraduate students to combine his third year Computer Science project with a commercial backer, to develop an innovative monitoring solution for the licensed retail sector. In addition to bringing to market the world’s first CCTV video multiplexer, Mike’s companies have developed the first viable digital recorder and video server, and the only inherently secure IP video system on the market with innovative video analytics. This includes the detection of Fire with video cameras in environments where no other detection method is possible. Under Mike’s leadership and through the benefit of his insatiable desire to continually break new ground in technological innovation, NetVu and it’s predecessor organisations have consistently been the thought leaders in the development of CCTV technology for three decades. And now Mike is reinvesting the fruits of his success to help establish the innovators of tomorrow. Mike has previously funded PhD Scholarships in the School of Mechanical, Aerospace and Civil Engineering and his company NetVu is now collaborating with the School of Physics and Astronomy to further advance the innovative video Flame and Smoke detection systems. This has provided invaluable financial support to some of the region’s brightest scientific doctoral students. 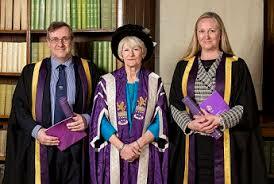 In April 2017, Mike was welcomed into the The Beyer Circle of Benefactors with a number of other leading Manchester Philanthropists supporting the University of Manchester in many forms. The intention is firstly to ensure the UK and more specifically, Mike’s home region of the North West, continues to be the home to world leading innovators in the fields of Science and Engineering. But also Mike wants to play his part in getting the word out that science is cool and science innovators are the technology rock stars making the world a better place. 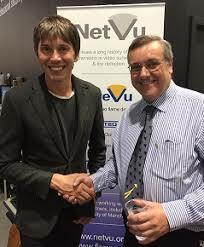 In this endeavour Mike is enthusiastically treading the same boards as fellow University of Manchester trend setter, Professor Brian Cox, whom recently joined Mike at a networking event to discuss everything from cyber security to astrophysics. Through his work at the University and on TV and radio, Professor Cox has made science fun and cool, inspiring a generation of bright young minds to dedicate themselves to science. Through his funding support of PhD students at Manchester, Mike hopes to do the same. Described as one of the top 30 most influential entrepreneurs of all time1, Mike has ensured the UK has been the centre of CCTV surveillance innovation for the last 30 years. The hope is one day one or more of the beneficiaries of NetVu’s funding support will continue this legacy of technological leadership. Find out more about how NetVu and its suite of CCTV surveillance solutions, including secure closed IP CCTV and FireVu, can benefit you by calling us on 01928 706 400 or emailing us at info@netvu.org.uk.